I have been at the Good Food Show Winter in Birmingham all weekend, I was mostly on the Hotpoint Stage doing live demonstrations. It was such great fun as always! I know I always bang on about it but one of the best things about the shows is that I get to meet so many lovely people who support me and who follow me on Twitter and Instagram. I stayed at Hampton Manor in Hampton-in-Arden, Solihull. I have been staying here for a few years now and it just gets better and better! The rooms are beautiful and the food is fantastic, but most of all the service there is what makes it. The staff are so enthusiastic and knowledgable. 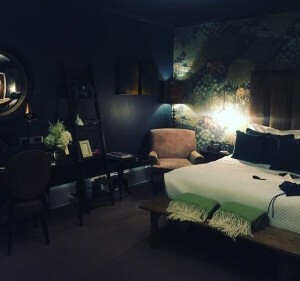 It is a real treat to stay there, really relaxing and lovely after and an added bonus after the crowds at the Good Food Show. 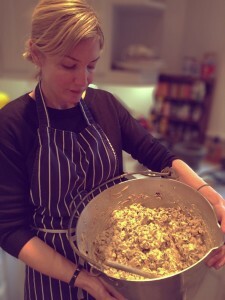 Today I am making my Christmas cake and mince meat for mince pies and the house is filled with the smell of Christmas. Anyone who is here when I make the cake gets to have a stir and make a wish, those who aren’t here get to make theirs over the phone! it’s tradition! I am also getting the advent calendar chocolates ready and the Elf On The Shelf will be back again tomorrow for another Christmas stint! 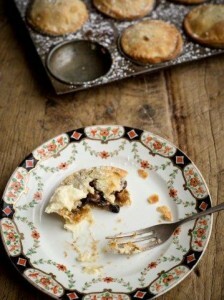 I have included the recipe for my mince pies here, the mincemeat is so easy! 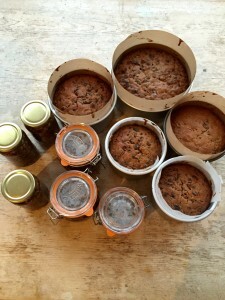 Trust me, when you’ve made it once you will never want shop bought mincemeat again. Let me know how you get on! 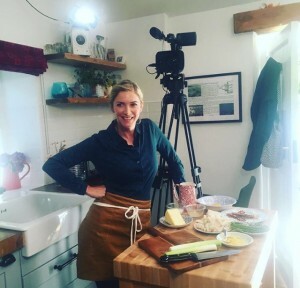 As always I love to see your photos of my recipes you have made, you can follow me on Twitter – @lisafaulkner1 and on Instagram- @lisafaulknercooks . On Sunday I will be at The Good Food Festive Fayre at Hampton Court Palace. I am particularly excited about this one as anyone who knows me will know I have history with this beautiful place…I was christened there, in The Haunted Chapel and my grandfather used to work there and was responsible for the maintenance of the beautiful stained glass windows so we were regular visitors there when we were younger, privileged to be allowed to run around and explore where the public aren’t usually allowed! You can find more information about the food show and tickets here. Come and say hello! The past few weeks have been busy as usual! I went to the Cake and Bake Shows in Edinburgh and Manchester. 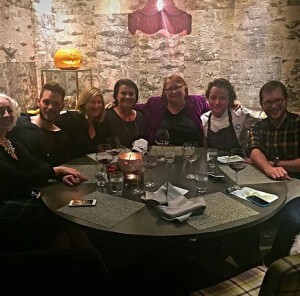 On the Friday night in Edinburgh a few of us went to see my lovely friend Tom Kitchin and have dinner in his amazing Michelin starred restaurant “The Kitchin”. They gave us a tasting menu and every single dish was absolutely delicious. 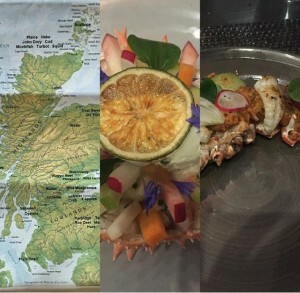 One of my favourite dishes was the Spider Crab, it was incredible!! All the food is locally sourced and is cooked with such care…his food makes me emotional it is so good! We had a little tour of the kitchen and it was great to catch up with Tom, he really is one of the chefs that has most inspired me. If you are in Edinburgh you must go! 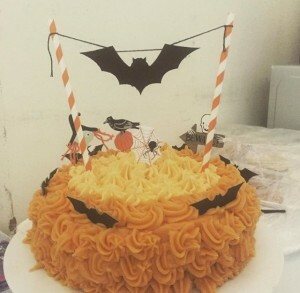 At the Cake and Bake Show I transformed my Strawberry Milkcake (recipe) into a Banana Milkcake , but I used orange food colouring and gave it a Halloween makeover! As always it was great to meet so many people in Edinburgh and Manchester who came to see me and say hello. I LOVE those shows! I got properly into the Christmas spirit when I went to film an episode of Denise Does Christmas for Food Network. Denise is a friend and it was really lovely to get to cook with her, I made some exciting veggie alternatives for Christmas day (I will share the recipe in the coming weeks!) I know the team really well and it was fun to see everyone and spend a day pretending it was Christmas! I have been filming for Food Tube and Hotpoint, so keep an eye out for me on those channels in the coming months. I made Juicer Muffins, Individual Cheesecakes and Crab Linguine, to name a few! I have included the recipe for the Juicer Muffins here, they are a really healthy recipe with hardly any sugar…great for breakfast or a snack…and guilt free! The Friday before last B and I went to It Takes Two. 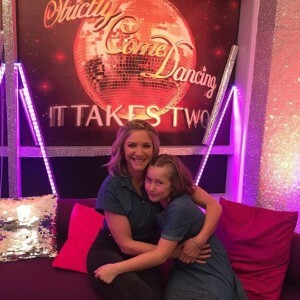 We are both big Strictly fans so it was great fun to be there on the panel. My friend Kelly Bright, who I haven’t seen for ages, was there and she is doing so well! I feel very proud of her and she said that she had felt the same way about me on Celebrity MasterChef! Everyone there was so lovely and you can see that they have all really bonded and are like a little family! I had a brilliant time! 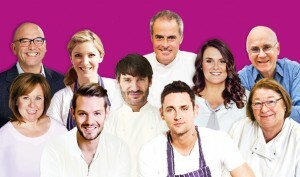 The BBC Good Food Show Winter, Birmingham (Thursday 26th, Friday 27th & Saturday 28th November) info and tickets here. The BBC Good Food Festive Fayre at Hampton Court Palace (Sunday 6th December) info and tickets here. I’m off to cook as usual, this time for my sister who is now a veggie…I absolutely love coming up with recipes for her to try! I will be sure to share any winners! I’ve recently been using more and more coconut oil in the kitchen, well actually not just in the kitchen – but I will come on to that in a moment! I am always playing around with ingredients and flavour combinations, while also trying to make my creations as balanced and as healthy as possible. Cooking with coconut oil is one of the healthiest and lightest ways to cook – from roasts to stir fries to baking and dressing, it proves to be a very versatile ingredient that can instantly transform dishes that lack a little excitement, while also being genuinely healthy. I don’t look at it as a substitute for oils but as another option that happens to have some great health benefits. Coconut oil is solid at room temperature so I store it in the cupboard and even if does melt a little, it’s just as good and actually makes using it for other things much easier. The first time I cooked with this, I also used a little on my lips – I got a couple of funny looks from my daughter Billie, but once I showed her the magic of it she is now always sayings ‘Mummy I want my coco lips!”. I also used it to moisturise my skin when on holiday in France recently, it is really effective and skin feels instantly more hydrated! Another healthy ingredient I have discovered this Summer is Groovy Foods Agave Nectar. The Agave Nectar is a delicious (and organic) alternative to sugar that doesn’t pile on the pounds as soon as you look at it. They come in different intensity levels as well so you can choose whether you go for a rich, dark, mild or if you fancy just a hint of sweetness in your dish, you can opt for the light amber (which is still super sweet). I use this in porridge, in smoothies and baking now, actually anywhere you need squirt of sweetness… it’s become a staple in our house. Now Autumn is here and the nights are drawing in, we all feel like snuggling up in pyjamas and eating comfort food, so it’s perfectly natural to want pudding… here is a recipe I created with The Groovy Food Company. It’s for Ginger and Coconut Puddings. Have a go and let me know how you get on. I will be at The Cake and Bake Show in Edinburgh this weekend, come and say hello! 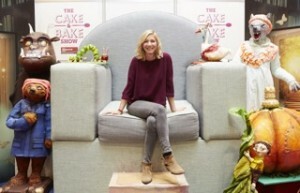 I am so looking forward to it, I absolutely love The Cake and Bake Show! You can get tickets and info here. Please continue to send me any pics of my recipes you have made, I love to see them. 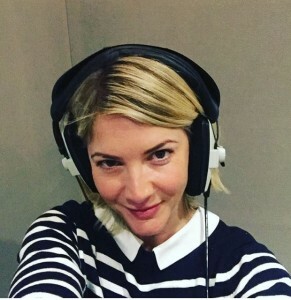 You can follow me on Twitter @lisafaulkner1 and on Instagram @lisafaulknercooks. Have a lovely week…it’s half term…hurray! Last week I went to Henley Literary Festival. My lovely friend Kate Jenkins of Gower Cottage Brownie fame (the best brownies you can get!) interviewed me about all things Tea and Cake. 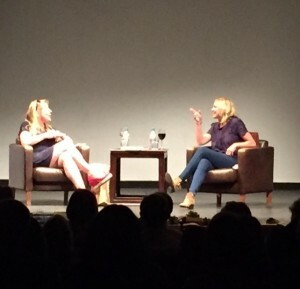 I have to say the audience was the nicest bunch of people and Henley made me feel very welcome! 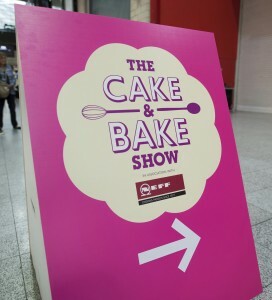 My weekend was spent at one of my favourite events, the Cake and Bake Show, London. I did a bake classroom, where I demo-ed my strawberry milk cake and the icing I used on Billie’s birthday cake, also my orange almond cake. My two favourite things about this show are hanging out with my friends, Jo Wheatley, John Whaite and Eric Lanlard, but also meeting the people that buy my books and tweet me. Getting from one side of the exhibition to the other takes me ages as people stop me to chat and say hello and I absolutely love it! 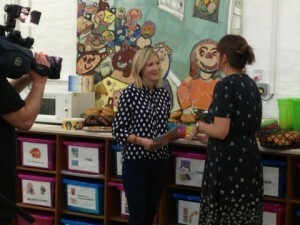 I feel very honoured to have been asked by Good Morning Britain to launch their Phones For Food Campaign as part of ITV’s Tackle Hunger Together season in conjunction with a great charity called Magic Breakfast. 3.8 Million children in the UK are growing up in severe income poverty and 1 in 3 Children in the UK miss out entirely on breakfast, with many being too hungry to learn. Magic Breakfast Clubs have been set up across the country, they provide a healthy, nutritious breakfast in schools. The average breakfast costs 22p per child and if you donate your old phones Good Morning Britain will recycle them and turn it into money! Teachers have reported a marked difference in pupils’ behaviour and concentration levels since they have been going to the breakfast clubs. For some of these children the last meal they have had was the lunch they were given at school. For some quick breakfast inspiration I have shared three of Billie’s favourite breakfasts here and on the GMB website. I am really proud to be the ambassador for Hotpoint. 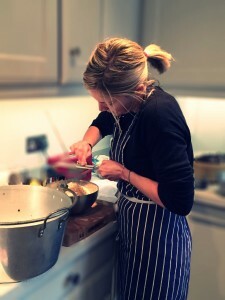 Last week I did a creative master class on top tips for fun and tasty family cooking. I made Blueberry and Ricotta Hotcakes and Pizza Bianco which food bloggers and members of the food press cooked with me, which was lots of fun…I cooked Chorizo and Pea Quesadillas, Chicken Milanese and Pink Spaghetti which everyone got to taste. I gave a few hints and tips for how to be creative with the whole family in the kitchen. It was a really great evening! The whole #LoveYourKitchen campaign is about being able to enjoy quality family time in the kitchen. 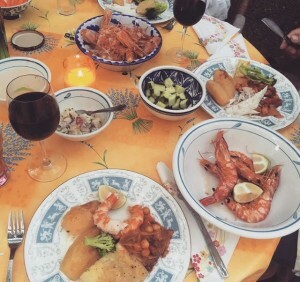 I am a strong believer in eating together, as a family at the table. I think it is so important to sit down and for everyone to talk about their day or make decisions or plans as a family. I understand that a lot of people can’t do this every evening as parents are working late etc, but even one day or evening a week is better than never! I am all for getting children involved with the cooking too, it is a brilliant time to chat about all sorts of things and it also encourages fussy children to eat as they have had a hand in preparing it. 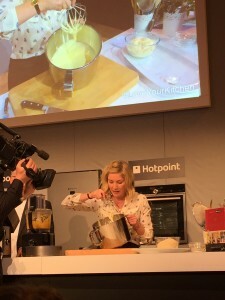 There are some recipes on the Hotpoint #HotHacks page along with some tips from me. I have included the recipe for Blueberry and Ricotta Hotcakes here. I hope you like it! Remember I will be at the Cakes and Bakes Show in London on Saturday 3rd & Sunday 4th October, I can’t wait! You can buy tickets here. I had an amazing summer! I took the whole summer off for the first time to spend it with B and my family. I feel so lucky to have been able to do it! We rented a house in the south of France which was perfect. 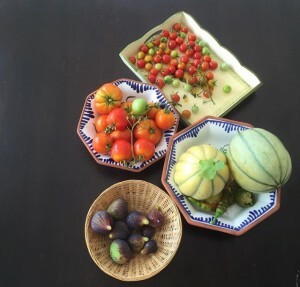 We had fruit and vegetables growing in the garden, which we ate from most days. It was really exciting to go and pick things and then prepare lunches and dinners from our little harvest! 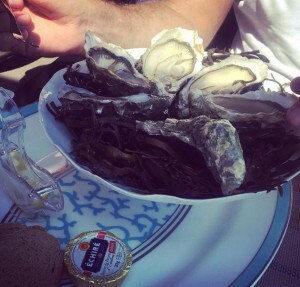 We visited St Tropez, which I love. 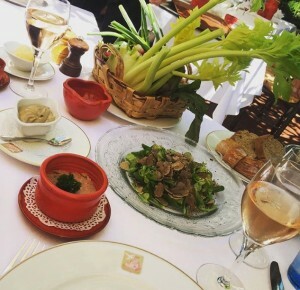 Also John and I stayed at La Colombe d’Or for a special treat, what a beautiful place where the food was incredible! We had a lovely time. I love France and speaking French and it was lovely to have involved all the children with the buying and the cooking of food…and speaking a bit of French too! We had friends and family to stay in staggered visits…we did yoga every day and read our books. We played in the pool. We cooked and ate. A lot. The weather was beautiful and it was so good to sit back and really relax. 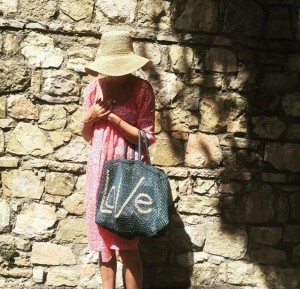 It really was wonderful summer. I came back and got straight back into work. I did two brilliant food festivals at Nottingham and Bolton, which were both great fun. I love doing the demos and meeting such lovely people, also meeting up with old friends from the “food world”. I have just got back from a week in Pembrokeshire. I was filming “Coastal Cottage” for ITV’s This Morning and it really was one of the best shoots I’ve ever done. I enjoyed every minute. I will tell you more when I can as I don’t want to give too much away! 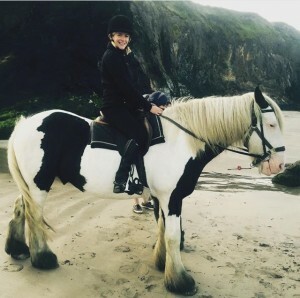 I will say that Pembrokeshire is one of the most beautiful places I have ever visited, I will definitely be returning in the near future, especially for the wonderful horse riding experience! This week I am working with Hotpoint, I love working with these guys, they’re great fun. 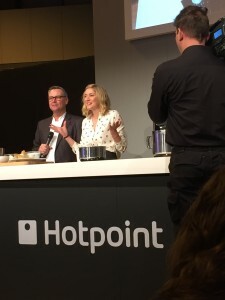 I have been in the booth doing lots of radio interviews and we are coming up with recipes to cook with the family and with children which will be available on the Hotpoint website soon. It has been a very exciting week in our house as John’s book came out! Obviously you will say I’m biased but the book is beautiful and brilliant and I just couldn’t wait to cook from it. I made Indonesian Fish Curry first and then the Mango and Passion Fruit Steamed Puds at the weekend. Both were absolutely delicious and really easy too! I asked John a couple of times if I was doing it right but he told me to just pretend he wasn’t there and follow the recipe! 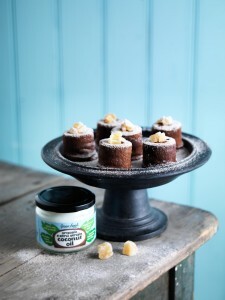 They worked a treat, both recipes were very easy to follow and tasted wonderful! Here’s a link to buy My Kind Of Food , I highly recommend it! It is packed with great recipes for friends and family, plus loads of little helpful tips too! In other news, I have reached 99,500 followers on Twitter and 11,200 on Instagram! I can’t believe it! I wanted to thank you so very much for all your support. Please continue to send me photos of the recipes you make from my books, I absolutely love to see them! Especially form Tea and Cake! 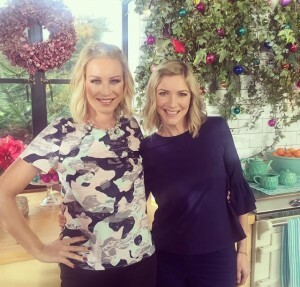 If you don’t already follow me my Twitter handle is @lisafaulkner1 and it’s @lisafaulknercooks for Instagram. There are some dates in the post below if you want to come and see me and say hello! I love the food shows and meeting people!